The Long Thread kicks off a series of posts called A Recycled Valentine’s Day. Go get the instructions on how blogger Ellen made the adorable recycled Valentine’s day heart seen above! Design Sprout offers a great, comprehensive list of 50 Must-Read blogs for the Conscientious Shopper. Eco Child’s Play discusses baby essentials that aren’t, starting with the one item every parent typically deems a “must have:” the crib. The Not Quite Crunchy Parent tackles global warming in the January Green Moms Carnival. Head over there to read a multitude of posts from a variety of different bloggers on the topic. The Long Thread kicks off a series of posts called A Recycled Valentine's Day. 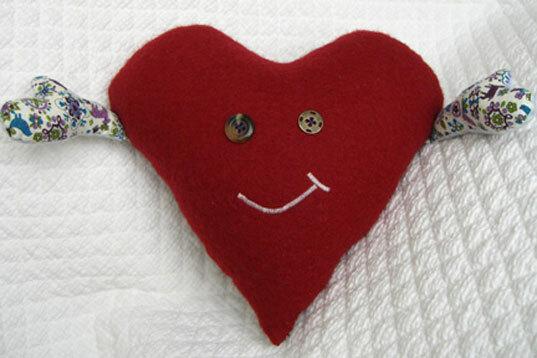 Go get the instructions on how blogger Ellen made the adorable recycled Valentine's day heart seen above!